One of the biggest things I try to teach in my business is versatility. How can we take one item of clothing in the wardrobe and create several different looks with it? Today, I am going to show you how to take a statement blazer and create three different looks with it. I’ll show you how you can pull it casual and how to make it work appropriate. One of the worst things is feeling like you can only wear one item of clothing one way with specific items in your closet. Step out of your comfort zone and try to put new things together! We’ve all been there, where we have a girlfriends birthday dinner, and we are thinking, what the heck am I going to wear? See that blazer that is hanging in your closet? Grab that and lets work with it. 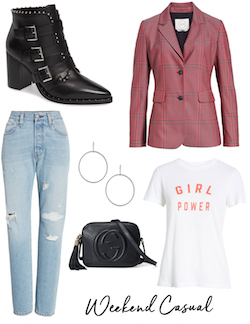 This GNO styled look is all based around this pink plaid blazer from Nordstrom’s. Layered over a black lace tank and paired with flare denim for a fashion-forward look. The look is finished with a fun white block-heeled bootie, delicate accessories, and white Gucci bag. A question I often get is, how I can incorporate my weekend wear pieces into my work wardrobe. Well, this work wear outfit is a perfect example. 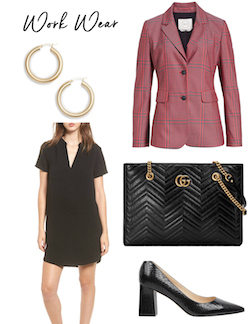 Take the same fun blazer and layer it over a little black dress. Overall, keep it simple and classy with a gold hoop and black pump. Of course, you cannot go wrong with a Gucci work bag. You’ve seen this blazer styled for a girls night out and work, but you may be wondering how to style it just for fun weekend casual; layer over a graphic tee and pair with the ultimate distressed 501 Levi’s Denim. Complete the look with earrings and a studded heeled boot if you’re a heel lover like me or a fashion sneaker. This is just three ways to style this pink plaid blazer! A statement blazer that you may have thought could only be worn to the office, can now be worn to multiple occasions. You no longer have to worry about feeling guilty on a purchase you make on an item you think you will only get minimal use out of. Stay tuned for more blog posts on mixing and matching items in your wardrobe.